At Jim’s Antennas we’re not only experts in installing televisions and antennas, we also provide data point installation services as well. Connection to the internet is vital in the current information age. Therefore, data points are a necessity for any home or office. Correct installation in the optimum location is therefore of paramount importance. 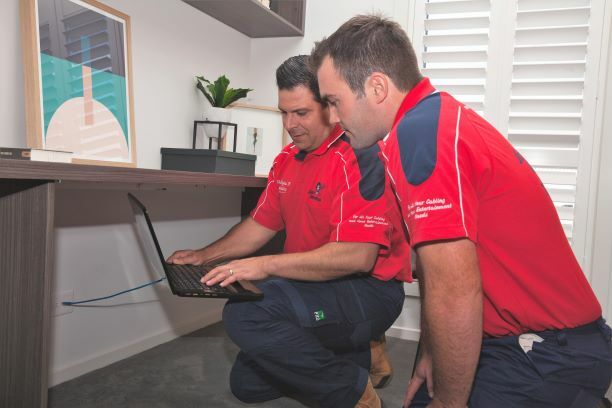 Whether you need an ADSL service installed on the back of telephone cabling, a cable modem, NBN or fibre, we have the expertise and experience to meet all your data outlet installation needs. We can identify the optimum method of data delivery for your particular home or office and ensure that all measures are taken to give you the very best connection. We also provide computer data cabling services where necessary to ensure your PC can go exactly where you want it. This service is especially useful if you’re intending to set up a home office where computer placement and internet connection are extremely important to your productivity. If you need data outlets installed or require relocation or repair of existing points, or you’re looking into computer data cabling as an option then get in touch with us at Jim’s Antennas. Our friendly team is eager to help you. We provide a fast and hassle free service throughout Australia. Call today on 131 546 or fill in our online contact form for a free, no obligation quote.